In 2004, Royal Caribbean, looking for an alternative to New York's overcrowded and under-efficient cruise terminal, moved its ships across the Hudson River to New Jersey. The cruise line set up shop at the former Bayonne Military Ocean Terminal (which has now been renamed the Peninsula at Bayonne Harbor) on a 430-acre manmade point of land. And so Cape Liberty Cruise Port got its start. In preparation for the arrival of RCI's Quantum-class vessels, Quantum of the Seas and Anthem of the Seas, Bayonne's Cape Liberty cruise facility underwent renovations to both accommodate the larger ships and to make passenger traffic flow more smoothly. 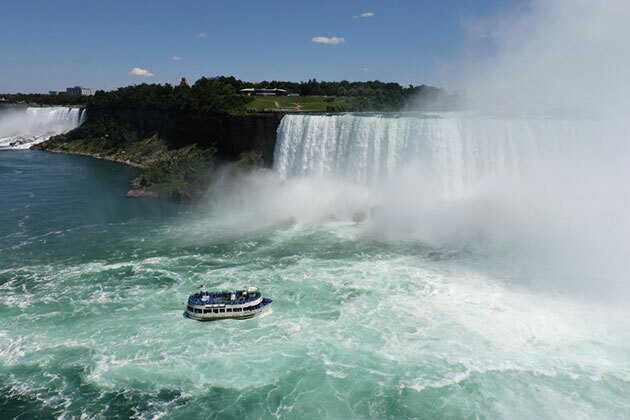 The port offers outstanding views of the harbor, the Statue of Liberty and lower Manhattan. But Bayonne itself is primarily a residential community, rather than a hot spot for tourism. Truth be told, the port is rather drab and industrial looking. Indeed, Bayonne's best asset is its proximity to bustling communities like Hoboken, Jersey City and, of course, the Big Apple, only seven miles (or a 10-minute drive) away. For most folks, the port is close enough to Manhattan to take advantage of all that the city has to offer. While Hoboken has become an "in" place for young urban professionals to settle (or at least rent overpriced apartments in aging brownstones), droves of other Jerseyans -- and New Yorkers! -- come in the evenings and on the weekends to eat, drink and enjoy the postcard-perfect view of the Manhattan skyline from the waterfront. Another waterfront garnering major attention is that of Jersey City, the gateway (on the New Jersey side, anyway) to two of New York's most important sites: Liberty Island and Ellis Island. Liberty Island is, of course, home to Lady Liberty herself, and the main building on Ellis Island is a museum dedicated to the history of immigration. Parking is available at the port for $20 per day ($7 for a pre-approved day pass only) and $40 for oversized vehicles like campers or RVs. 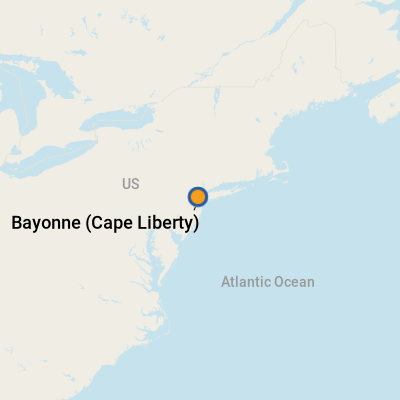 The Cape Liberty terminal is in a remote location, and it's not possible to walk anywhere. The terminal has restrooms and free Wi-Fi but not much else. We've heard whispers about possible vending machines and food trucks, but nothing is set in stone just yet. You can't walk to the cruise terminal from public transportation; you'll have to drive in, take a cab or shuttle bus. Cape Liberty Cruise Port is accessible from Newark Liberty International Airport, via the New Jersey Turnpike (I-95). Guest parking is available adjacent to the cruise terminal. Check their Web site for parking information and pricing. Direct buses, arranged by the cruise line, operate between northeastern cities and the pier on cruise days. Once at Cape Liberty, cruisers can take the NJ Transit Hudson-Bergen Light Rail via the Bayonne station, which connects to Amtrak, PATH trains and ferry service to/from New York City via Hoboken Station. The rail station is about three miles from the port, but RCI provides a complimentary shuttle to and from the station on cruise days. The light rail connects Bayonne to Hoboken and Jersey City. Taxis are also readily available on embarkation and debarkation days. There are no rental car companies set up at the port, but there is an Enterprise Rent-A-Car in Bayonne (1347 Kennedy Blvd. ; 201-436-9814). Enterprise centers are generally willing to provide pick-up and drop-off service, but be sure to call for more information in advance. The port is accessible from three New York City-area airports -- Newark Liberty International Airport, John F. Kennedy International Airport and LaGuardia Airport. Taxis are readily available at all airports, and fares are either fixed or metered, not including tolls. The currency is the U.S. dollar. International visitors will find it easy to access cash at numerous ATMs. Exchange bureaus so common in Europe are not in the U.S., but major banks do provide exchange services. The Madison Bar & Grill: Local Hobokenites go crazy for lazy Sunday brunches; just about every pubby, clubby restaurant in the city offers a "prix fixe" brunch buffet, many with free bellinis, bloody Marys and mimosas, but this is the place to go. Don't miss the creme brulee French toast. (Open weekdays at 11:30 a.m., Saturday at 11 a.m. and Sunday at 10 a.m.; 1316 Washington St., Hoboken; 201-386-0300). Anything New York-themed makes a great gift. Head into the Big Apple for your pick of souvenir shops that sell everything from Statue of Liberty figurines to "I [Heart] NY" T-shirts.